The Tonight Show with Conan O’Brien: What Happened in the Last Episode? After only seven months and 146 episodes, The Tonight Show with Conan O’Brien came to a close. The finale began airing on January 22nd and ended on January 23, 2010 — the five year anniversary of Johnny Carson’s death. O’Brien’s monologue is peppered with jabs at NBC, as it had been for the past week. He jokes that, since his settlement prohibits him from hosting another show for seven months, Andy Richtor will begin hosting a show the following week — with O’Brien as his sidekick. He reminds the audience that they’ve all had a lot of fun doing the Tonight Show but, like everything in life, it must come to an end — a decade too early. He then unveils the latest in his series of very expensive jokes that NBC must pay for. It’s a rare fossil skeleton from the Smithsonian, spraying beluga caviar on an original Picasso painting. Total cost? $65 million. After having a good laugh, he assures the audience that all of the expensive gags have been just cheap jokes. Would O'Brien's ratings gone up if NBC had given the show more time? After the commercial break, O’Brien presents a compilation of funny clips from the show’s brief seven month run. After that, he announces that an NBC representative needs to conduct an exit interview with him. Surprise guest Steve Carell comes out and, with deadpan demeanor, asks O’Brien the reasons for his leaving the company and if he might consider working there again. He finishes the bit by shredding O’Brien’s company badge. Richtor helps, explaining that he just really likes to shred things. Tom Hanks comes out as the first official guest and he seems to be drinking scotch. When he hands O’Brien a glass, the host notes that it tastes like cream soda. Hanks apologizes for not bringing a glass for Richtor but the sidekick indicates he’s fine, pulling a flask from his coat pocket. Hanks and O’Brien banter for awhile and chat about their first meeting; when Hanks was guest-hosting Saturday Night Live and O’Brien was one of the writers. 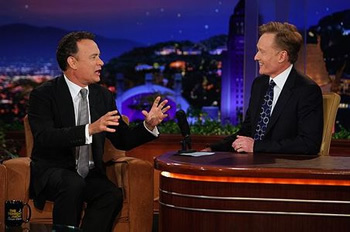 Hanks notes that he was the one that nicknamed O’Brien “Coco” in one of the first Tonight episodes last June. O’Brien’s still not fond of the nickname. Hanks leaves to zip across town to take part in the Hope for Haiti Now telethon. Before we end this rodeo, a few things need to be said. There has been a lot of speculation in the press about what I legally can and can’t say about NBC. And this isn’t a joke, to set the record straight, tonight I am allowed to say anything I want. And what I want to say is this: between my time at Saturday Night Live, the Late Night show, and my brief run here on The Tonight Show, I have worked with NBC for over twenty years. Yes, we have our differences right now. Yes, we’re going to go our separate ways. But this company has been my home for most of my adult life. I am enormously proud of the work we have done together, and I want to thank NBC for making it all possible. I really do. A lot of people have been asking me about my state of mind. Walking away from The Tonight Show is the hardest thing I have ever had to do. Making this choice has been enormously difficult (choking up). This is the best job in the world, I absolutely love doing it, and I have the best staff and crew in the history of the medium. I will fight anyone that says that I don’t (but no one would). But despite this sense of loss, I really feel this should be a happy moment. Every comedian dreams of hosting The Tonight Show and, for seven months, I got to do it. I did it my way, with people I love, and I do not regret one second of what we’ve done here. I encounter people on the street who give me a sad look but, I have had more good fortune than anybody I know and if our next gig is doing a show in a 7-11 parking lot, we will find a way to make it fun. And finally, I have to say something to our fans. This massive outpouring of support and passion from so many people has been overwhelming for me. The rallies, the signs, all the goofy, outrageous creativity on the Internet, and the fact that people have traveled long distances and camped out all night in the pouring rain (it’s pouring — it’s been pouring for days!) to be in our audience. Here’s what all of you have done: you’ve made a sad situation joyous and inspirational. So, to all the people watching, I can never thank you enough (chokes up) for your kindness to me and I’ll think about it for the rest of my life. All I ask of you is one thing: please don’t be cynical. I hate cynicism — for the record, it’s my least favorite quality and it doesn’t lead anywhere. Nobody in life gets exactly what they thought they were going to get. But if you work really hard and you’re kind, amazing things will happen. I’m telling you, amazing things will happen. Ferrell is the show’s last guest. It’s appropriate since he was also the series’ first guest, back in June 2009. Ferrell (dressed as a member of Lynyrd Skynyrd), ZZ Top’s Billy Gibbons, Beck, Ben Harper, and Max Weinberg and the band perform “Free Bird” — with O’Brien joining them on his Les Paul. 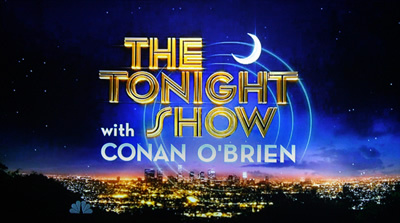 As the song finishes, the credits roll and the short run of The Tonight Show with Conan O’Brien comes to a close. End of show. Note: Jimmy Fallon opened his show with a short tribute to O’Brien in Conan’s old New York studio, 6A. It’s disrupted at the end by Dr. Oz who currently tapes in that studio. What do you think? Was O’Brien’s last episode memorable? How does it stack up against his last Late Night? Do you think O’Brien’s ratings would have gone up over time? The Tonight Show with Conan O’Brien: Host Fights Back, Will He Be Cancelled? The Tonight Show with Conan O’Brien: Respectable Premiere Ratings; Cancel or Keep Conan? Conan was a dud from the start,no from before the start. His ratings, a drop of over 45%, show this to be true. I think, they made a huge mistake. I never watched Leno, still don’t, love Conan and will follow wherever he is on Television. The last episode really proves why Conan has such a fanbase. Here’s to you CoCo! He could of went out talking alot of **** to nbc trashing the place, but we out like a man and said only nice things of nbc, that was great! Conan will do great at fox, where i hope he goes in sept. Hoping fox or whoever picks him up hires his entire crew! Hes way better than leno, letterman,kimmel!! Love Conan, loved the show….he’s a really sincere guy who hides it under a veneer of snark, but like he said, people should not be cynical. It’s that quality that has never allowed me to watch Letterman. He and Paul are open cynics and cynicism is negativity. I wish CoCo and the gang luck and will watch them wherever they go. P.S. Please fix your typos! @MK: Thanks for sharing your comment. FYI, if you find a typo, it would be helpful to note what it is. Thanks.